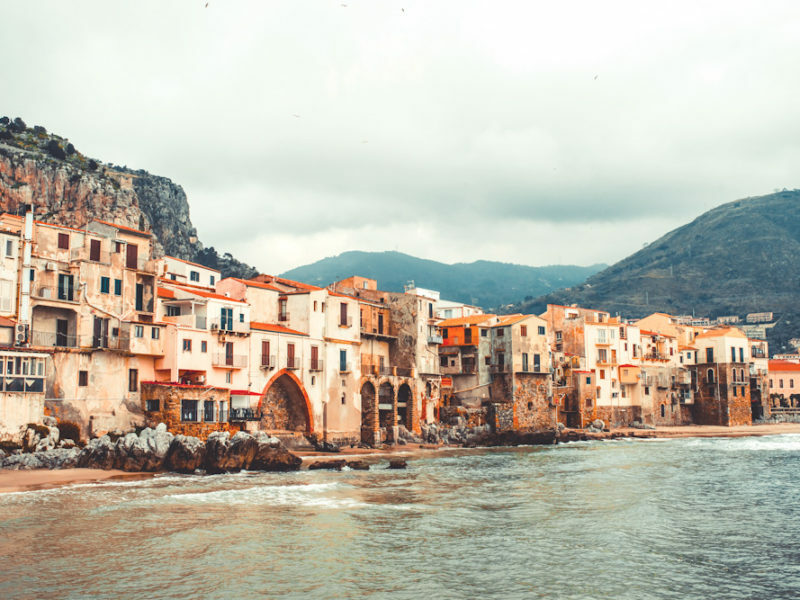 The fishing port of Cefalu, Italy overlooks crystal clear water. … and with an impressive 8 entries in our 100 Secret Gems You Need To Know About list, it’s a must-visit for those who love history, culture and cheese. This small island forms the heart of the evocative old town of Syracuse on the east coast of Sicily. Its tiny size and isolation has allowed Ortigia to retain its rustic charm after centuries of settlement by the likes of the Greeks, Byzantines and Romans. In Ortiga, Italy, locals and tourists enjoy a dip in the turquoise waters. Its creamy white-columned Duomo di Siracusa and wide Piazza Duomo are scorched by sun during the summer months, while its narrow medieval streets, populated by crumbling Baroque palazzi and myriad churches, festooned by clotheslines of colourful drying washing, provide cool respite in the heat of the day. When the sun sets after a day of eating Italian food and swimming off the rocks in the Ionian Sea, the buildings that have stood resolute for centuries are bathed in a warm honey hue. In the Tyrrhenian Sea, north of Sicily. Accessible by high-speed ferry from the Sicilian town of Messina, these largely undiscovered islands, which are dotted across 1600 square-kilometres, are anchored by Lipari, with its ancient ruins and relatively bustling town. A view of the Mediterranean sea from the Aeolian Islands. The outer islands offer the ultimate Mediterranean experience: Salina with its verdant landscape and lazy villages; the jet-setter’s hideaway of Panarea (Giorgio Armani has a house here); and the rugged beauty of Stromboli, its main town clinging to the base of an active volcano. This town is snuggled in Tuscany’s Val d’Orcia region. Sitting atop a hill and boasting breathtaking views of the rolling greens of the Val d’Orcia, Pienza was declared a UNESCO World Heritage Site in 1996 for its superb Renaissance architecture that dates back to the 15th century. The rolling green hills of Pienza, Italy (photo: Vanessa Jackman). This charming medieval town is also considered the capital of pecorino cheese – if you visit in early September you may be able to celebrate the cheese festival, when the town is abuzz with activity. Set atop a rock in Viterbo Province. Perched on a plateau formed by the Chiaro and Torbido streams, wind and rain is gradually eroding the volcanic rock on which it is perched, its lovely buildings slowly falling away. For this reason it’s known as ‘il paese che muore’, or ‘the town that is slowly dying’. Civita di Bagnoregio in Italy is perched on top of volcanic rock. An elevated walkway carries you up to the citadel, where you’ll find pretty plazas, a museum and the exquisite Villa Cuevas if you plan to stay overnight. In Palermo Province on the northern coast of Sicily. This medieval town is so pretty that Giuseppe Tornatore set parts of his masterpiece Cinema Paradiso here. 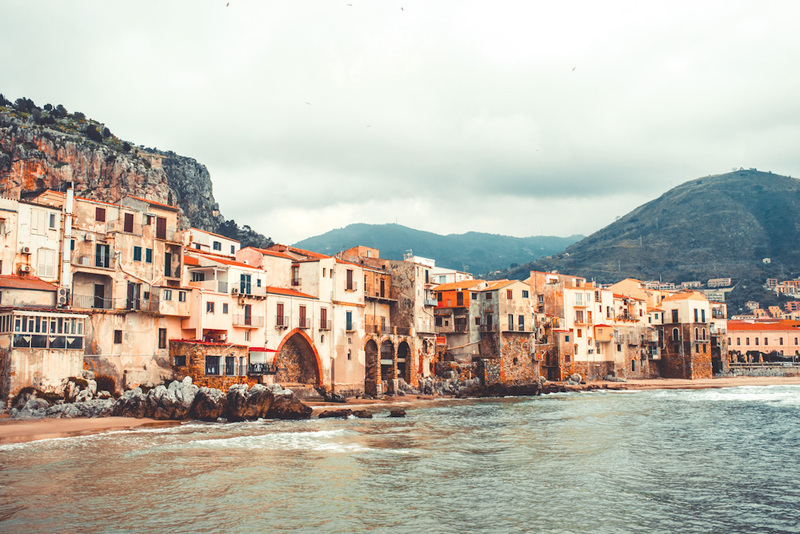 With a fishing port hugging a sparkling, crystal-clear cove, a popular stretch of beach, and plenty of historical sights to explore, such as the magnificent cathedral, Cefalù is the basis for a perfect Mediterranean getaway. The whole town is set off by the colossal Rocca, an outcrop of rock that dominates the skyline; climb it for views along this spectacular corner of Sicily. In the Genoa Province on the spectacular Portofino Peninsula. Just around the peninsula from the idyllic village of Portofino, Camogli is its big brother in the beautiful parcel of land that makes up the Parco Naturale Regionale di Portofino. Towering palazzi sits along the beach of Camogli in Italy. While Portofino has always been a quaint fishing village, Camogli was a major seaport in the Middle Ages. Today, it’s a stretch of multicoloured, towering palazzi that sit along its beach, a busy little harbour and a popular retreat for Italian families, with great hotels and restaurants. South Tyrol in northern Italy. The ‘Gateway to the Dolomites’, Bolzano was once the meeting point between Italy and the Austro-Hungarian Empire. Bolzano produces unique alpine cheeses and wines, enjoy a glass while enjoying a view of Dolomites Mountains. Its streets are lined with pastel-hued houses and its farmers’ and flea markets sell the unique produce of the region, such as alpine cheeses and wines, and 19th-century artefacts betraying the region’s rich history. An historic town in the province of Treviso, in the north. Just 40 kilometres inland from Venice, the heart of Castelfranco Veneto is enclosed by a moat and medieval walls, some of the best-preserved in the country, its buttresses dating back to the 12th century. Medieval walls in the town of Castelfranco Veneto, Italy. At its heart is the Duomo, the cathedral, which holds its main attraction: the famous painting Pala di Giorgione, an altar piece by the town’s talented son, Renaissance painter Giorgione.